The author analyses juridical instruments delimiting the right to housing and access to adequate housing for low income groups in the European Union. She focuses on the relationship between the statement of intent expressed in international standard-setting documents of the United Nations, Council of Europe, European Union, and in the national constitutions, and establishment of the right and access to the right. 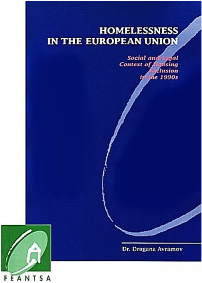 The author estimates the extent of homelessness and bad housing in the European Union and highlights characteristics of people who depend on public and voluntary services for homeless people. THe social context of housing excusion which affects homeless and badly housed people is provided through the analysis of socio-demographic processess and expected changes in households, housing supply, poverty levels, income insufficiency, traumatic events and personality characteristics conductive to housing and social exclusion. The impact of value systems on the perception of homelessness and the analysis of the functional basis of social solidarity provide the theoretical framework. Her analysis is based on the research work carried out by FEANTSA’s network of national correspondents in each Member State of the European Union.